A few months ago, I wrote a post on beauty and received some significant feedback about beauty both from men and women. I knew beauty held a special place in our hearts and minds even before I wrote it and so the feedback was just a validation. It even led to a friend opening up about her beauty issues and how much they have made her do what she does. Then recently, Lupita Nyong’o happened. Besides the fact that she acted a heart-wrenching role in 12 Years a Slave and won an Oscar, the other prevalent debate, especially on social media, is her beauty. I remember writing then that you may not be considered beautiful here but absolutely stunning in another part of the world. Lupita is your proof. I stumbled upon this beautiful speech she gives to black women here and I would urge to listen to it. She talks of a time she used to pray to God to make her a little lighter, which of course did not happen. Then Alek Wek stepped into the scene and made her start looking at herself a bit differently. Alek Wek’s response to Lupita’s mention is just as beautiful as she is. The one statement that stood out for me: Beauty should not be culturally relevant, it should be universal. I will be brief today. Like Lupita’s mum told her, you cannot eat beauty. You have to think beyond your external looks. Lupita would not be where she is just because of her beauty. That is a fact. Again, I ask you: You are beautiful, but what next? Also, listen to one of my favourites by Jonny Diaz, More Beautiful You. This is for the girls who love the Lord, but at times let the world get into their minds. I grew up ugly. I had the worst acne for close to 15 years. I never thought any boy would look at me twice, and I was right. However, I was talented, and I loved the Lord. Singing to Him was my passion and I did it excellently, because it was I believe what He wants. I am afraid of the Lord. I believe that you cannot mess with Him, if you do, you will regret it. Somehow, I managed to have the most intense four-year experience without even realizing how far I had fallen. My first day of university was full of promises to myself. I would make it work somehow and live a quiet, fulfilled life. It started out that way, but not for long. I was introduced to wine in 2010, and it was forbidden fruit I loved to taste. It made me sharper, I could recite formulae that I couldn’t have had I been sober. I was the kind of girl who dressed in t-shirts and jeans, and when I say t-shirts, I mean the round-neck long ones, not the girly things that are so common now. My life was fine then. I would attend class faithfully during the week. I would avoid large crowds of people, men, because I knew I was ugly. And in the weekend, I would drink myself to a shut-down and wait for Monday. In my second semester, I met a third year student in the most random of situations in school. Then he began to pursue me. I did my research on him. My sources said he was a good guy and I let myself fall into the fantasy. He cooked for me, went on night walks with me, massaged my feet on weekends and his kisses were amazing. He was tall and strong and when he kissed me, he would lift me (yes, like those scenes in movies). I remember changing my dressing instantly during that time. I wanted to impress him and it worked. When he said he wanted to sleep with me, I told him I was a virgin. We were under our usual tree and it was the first time I said aloud that I didn’t intend to wait for marriage, but I was still scared. I regret that day. Let me cut the story short, I didn’t sleep with him, and our relationship fell apart. A woman who feels ugly can never feel beautiful. A woman who sees herself as ugly can never accept in her heart that an incredibly handsome guy, or any other guy for that matter, wants her because of her beauty. And a woman needs to feel beautiful, it is one of those things that can only come from within. No amount of make up or trendy clothes will make the feeling of ugliness go away. His beautiful female friends will always haunt you at the back of your mind. When normal arguments come up, you will always feel like he is going to leave you. You will always feel like he can do way better, and because of these feelings you will overcompensate. You will go out of your way to make him happy, you will compromise on your values, and bend over backwards (or forward) to meet his every need. This is how far I have fallen. I like drinking myself to a shut-down when things get thick, but only matters relationship. Alcohol makes things seem easier; I am not advocating for its consumption, in fact it’s a habit I am in the process of shedding, but the ease of situations is only temporary. When you awaken, you will have a terrible hangover, and things will be just as bad. This is how far I have fallen, being unable to sing for the Lord in an actual altar, though I know that the Lord’s mercy is beyond human comprehension. Deep in my heart, I love Him, yet I still sin at times, but again, this is a work in progress. This is how far I have fallen. It is indelibly etched in my mind that I am ugly, and I deserve no man. 20% of my brain and 100% of my heart knows this is not true, and again it’s a work in progress. 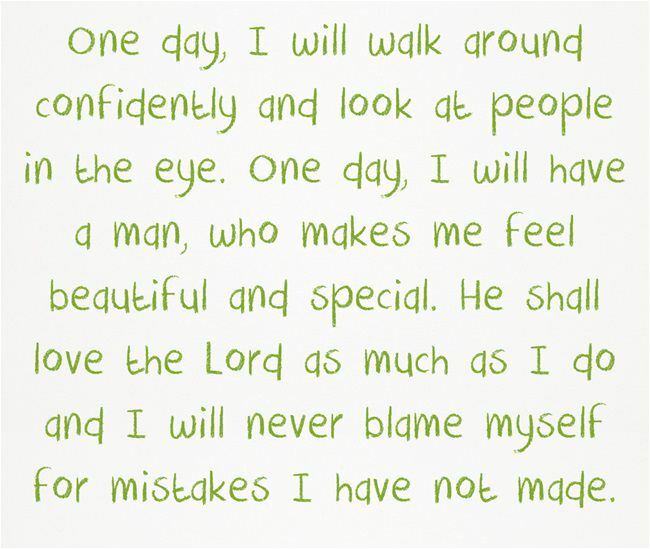 One day, I will walk around confidently and look at people in the eye. One day, I will have a man, who makes me feel beautiful and special. He shall love the Lord as much as I do and I will never blame myself for mistakes I have not made. One day, I will sit my daughter down and give her the story of how far I fell one time. One day, I shall know what it means to be beautiful, and I shall teach her and instill it deep in her mind. That even if she will have the terrible fate I have and not look at her face in the mirror for 15 years without shedding a tear or wanting to punch the mirror, that it is alright. One day it will all end, and everything will be alright. This is the story of someone really close to a friend of mine. She wrote it to her and wanted her to spread it to other women, so that they may know what some of us go through, and to reassure those with similar stories that they are not alone. My friend thought that I would want to post it here because she could relate to it in such a realistic way. Writer will remain anonymous.